C# is the primary language used to create Windows applications. This C# Programming course will teach you object-oriented programming concepts and use C# to build applications on top of the Microsoft .NET framework. In this course, you will learn how to take advantage of C# to create a wide range of Windows applications. This C# programming course assumes prior programming experience using any language such as C or Visual Basic. Students are expected to be familiar with concepts like variables, data types, loops, and arrays. 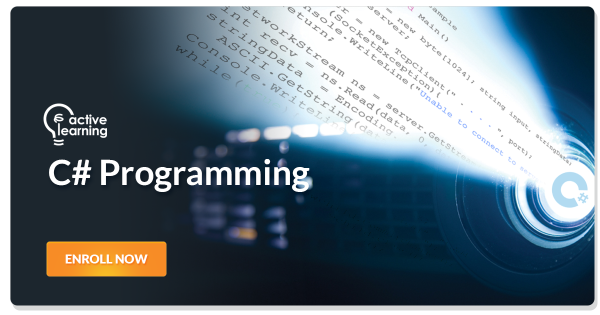 This course covers OOP extensively so knowing OOP is optional. Knowing HTML or SQL alone is not sufficient. "The course is good to start and know more about programming. The Exercises sums up most of all the coverage of the topics." "The instructor is very intelligent. He is so lively when it comes to teaching and making the subject more interesting. Cites different examples where we can understand more about it." "The course content mainly discusses basic C# syntax/uses. It is usable for me because I'm a beginner in C# environment."